I really look for the perfect gsoc student: someone who has a brilliant idea, noone else thought of how to improve linux in general or openSUSE in specific and just needs my guidance. But for those that need some ideas, my best bet is really to rewrite clicfs to make it even better. Right now clicfs is a FUSE filesystem hosting a loop image. So a page read goes from ext4->loop->fuse->clicfs->CD->clicfs->fuse->loop->ext4. Great idea, no? For someone who wants to become famous, it would be the perfect target! I had a side project the last two weeks: Make the build service more fun to use. Let me quote from the landing page of build.opensuse.org: “The openSUSE Build Service hosts 16,414 projects, with 107,691 packages, in 26,259 repositories and is used by 25,967 confirmed users.”. 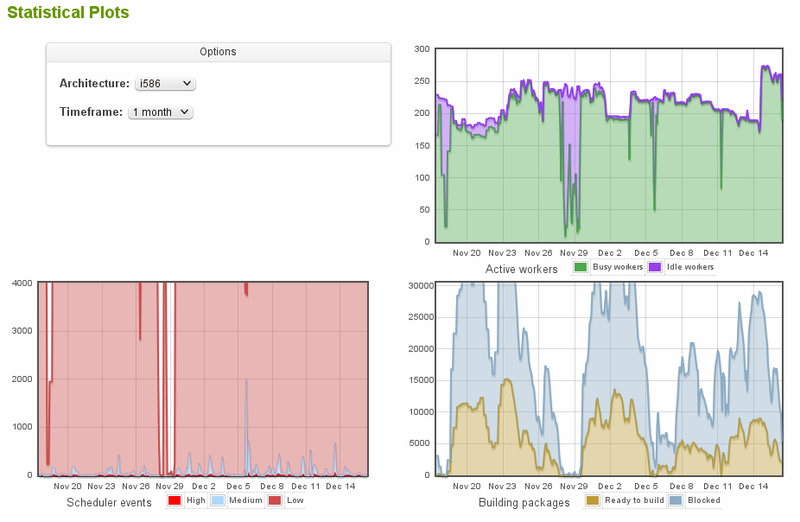 That are quite some high numbers – especially in the relation to the ~25 servers we have for actually building. Every 2nd weekend or so we have some pause where the servers actually idle around, the rest of the time they are usually under full load and it’s not exceptional that we have over 20,000 build jobs for said 25 servers at the same time. So if Sue comes wants to build her packages at that time, she competes with quite some other packages and she gets frustrated to still see “scheduled” when she goes away. So we use some algorithms in the so called dispatcher to distribute the power to the right packages. Over years of its existence the dispatcher used the algorithm I would dub “Randomness with exceptions” – it would if the job’s filename matches a regexp and if so, preferred it, otherwise picked a random job. Such algorithms create some fairness if you have 28.000 users all active at the same time, because there is usually not a really good balance between those. But with 2.0 this changed: we got load and priorities. A script of mine parses the logs of download.opensuse.org and counts how many users are for the repositories. From that I calculate priorities, so that repositories of interest to people get more build power than others. E.g. KDE:Release:45 for 11.3 is downloaded 65 more often than for 11.1, so the 11.3 packages should see more attention. For that the build service calculates how many workers were busy for the repositories and then allows a factor to lower that load while picking the next repository to build for. This is much more complex than “pick a random one”, but it lead to faster return times for those projects that see actual downloads (and new projects as they have no load registered). To give some fun for those actually working on their packages, we also lower the registered load if we see commits. But there was one problem left: with so many projects registered you also have quite some that aren’t interesting at all. They are not downloaded and very often not even their maintainers care, e.g. for some testing subproject they created in 2009 and then forgot about it. But those repositories build against the often changing openSUSE:Factory and see rebuilds because of that. Those repositories had a very low load because they have few packages, so they are often preferred over projects that have a lot of packages. To free up more power to recent changes, we now experimented with various ways. It turned out to be useful to look at the relation between since last source change in the project and time since the jobs are “scheduled”. From this we calculate a staleness penalty – when the job is freshly scheduled, it’s basically one chance for a worker for 2 months since the last commit to the project. But this chance rises quickly, the penalty gets smaller the longer the job is in scheduled. Even those projects that have no source commits are valid “customers” and deserve to be rebuild against the latest gcc from openSUSE:Factory. So what does this mean to you as user of the OpenSUSE Build Service? If you look at the list of binaries for a package (e.g. icecream), you may think that you can download the RPM right away – but if you follow the link in a browser you get to see details about the rpm. Now if you only want to download it, you may already know the details and don’t care. So I added a little shortcut: if you request the binary url with a client not accepting html explicitly (e.g. curl, wget…), you get the file directly. Just copy & paste the link to your console and be done. http://software.opensuse.org/stage includes now a little box to show what other people search for. It was a little idea The Boosters had, but I found the results so far pretty suprising. I didn’t really expect subversion in the top 3, but perhaps it’s only the moment. The results shown are from actual downloads, for that every download url is a little redirect to save the query the download was for. Part of our “umbrella” milestone, Pavol and Robert ported software.opensuse.org to the Bento theme. To get more feedback for it, I now deployed it as http://software.opensuse.org/stage. On top of that of course: the Bento theme is not yet finished – it’s only a stage deployment to get feedback. Just a quick note to everyone using factory and wonder what patterns-openSUSE-kde4_basis is all about: our patterns install packages now. So I use /dev/sdb in my commands to shorten it, normally I would use /dev/disk/by-id/.. directly to avoid overwriting my hard disk image. Now that milestone2 is almost done, we get into the next round and we decided (basically during coffee break) to try something and change the compile flags for our i586 distribution (which is still the major one for openSUSE). If there aren’t major problems coming up with it, the next milestone will be compiled with -fomit-frame-pointer -mtune=generic instead of the old -march=i586 -mtune=i586. On unrelated news: I’m away for a very long Pentecost weekend. If there are issues with Factory, I won’t be able to fix them. See you in June!